1. 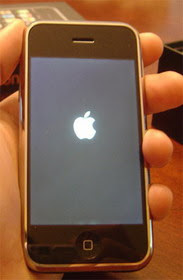 Press and hold Sleep/Wake and Home until the iPhone resets. 2. When the Apple logo appears release Sleep/Wake. Do not release Home until you see the prompt to connect the iPhone/iPod Touch to iTunes. You will then need to update the firmware, and proceed with restoring all of your applications and settings.